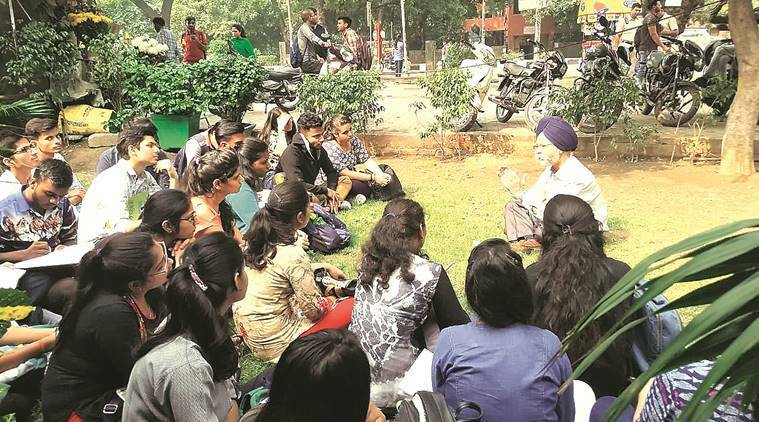 In the latest standoff between the principal and Governing Body chairman of the Dyal Singh College (DSC Morning), Principal I S Bakshi was not allowed to enter the college premises to take his class on Wednesday, forcing him to convene one outside the college gate. Bakshi said he has filed a police complaint in this regard. The college teachers’ association said they will go on strike from November 5 if the Governing Body chairman was not “immediately removed” from his position. They also received support from Rajouri Garden MLA Manjinder Singh Sirsa, who was present outside the college. “I had gone to the college on Monday to take my class. At that time there was no problem. But today, the guards stopped me at the gate, and said the chairman’s orders prohibited my entry. Then I called my students, roughly 25 of them, and took my class outside, sitting on the floor. I also informed the police and gave them a written complaint,” Bakshi said. Meanwhile, the DSC Teachers’ Association said Sinha had “compounded the crisis”. “The sordid drama unfolding here cannot be tolerated any longer and DSCTA along with JAC (Joint Action Committee) and DUTA will be forced to go on protest… if Mr Sinha is not removed immediately from the post of chairman… As a matter of fact, renewal of his term is due on November 3, and if DU authorities do not accept our demand, DSCTA will be forced to take precipitative action from November 5 onwards,” said DSCTA president P K Parihar.